The Guyana Gold Board (GGB) will have to mull whether to remove its laboratory in the wake of above normal mercury levels in 60 of the more than 130 workers of the Guyana Geology and Mines Commission (GGMC) that have been tested so far, Minister of Natural Resources Raphael Trotman said. Trotman announced in the presence of the Board of Directors of the Gold Board that he would like an “experts review” of the laboratory to determine how it could better function, where it should be situated, and needed scientific and other methodologies to ensure “safety comes first”. For several decades, the GGB has been located in the same compound as the GGMC on Upper Brickdam, but Trotman said authorities would have to consider the logistics, cost and adequate safety and security. “The longer term decisions have impacts and repercussions on the State’s revenues and so decisions can’t be made in a day, they can’t be made in a second; they have to be made over time,” he said. 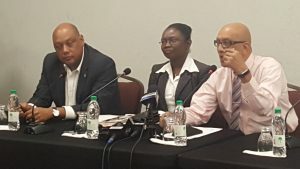 The Minister of Natural Resources said a South African team would be in Guyana for several days to explore the possibility of establishing a refinery. He noted that Guyana has been learning from other countries such as Suriname about the establishment of a refinery. Currently, the GGB sells gold to the Royal Canadian Mint. Guyana’s Environmental Protection Agency (EPA) has considered a “comforting” report by the Trinidad-based Kaizen Environmental Services that has since conducted unaccompanied inspections of the Gold Board building and yard. The report was expected to be released to the media later Friday. GGB General Manager, Eondrene Thompson said ambient air tests were conducted and they were expected to conduct mercury analysis. The Activation Lab, she said, has recommended that two monitors be installed before the port and the chimney to keep an eye on mercury emission levels. Asked if the GGB did not believe that it should be responsible for testing people who live and work in the area, Trotman said no one has been refused testing. “There has been no refusal to test anyone. It is for the experts to determine the radius, the parameters, the persons and so that is what we are working on out,” he said. GGB Chairman, Gabriel Lall stressed that his agency does not use mercury as part of its process. Although inspections conducted by experts showed that the mercury levels at GGMC compound were now normal, he said additional tests were still being done in the interest of the safety of workers and other persons in the general environment. “What we are doing is over-compensating. This is a continuous process for us and we want to give ourselves and the people outside there- everybody- that we are going above and beyond to put layers and layers of this inspection, of testing, results etc that we have got a comfort level to an extreme degree,” he said. So far, the Gold Board has spent more than GY$300,000 on the first round of testing.